As a parent, it’s my main priority (and responsibility) to raise a daughter who is well-rounded. I want my daughter to grow up having a healthy mind, body and spirit. Sometimes it’s easier said than done though. Parenting is definitely a lot of work, requires constant effort, and can often times be very challenging. I’m going to share some of the things I’m doing as a parent to raise a happy and healthy child. One way I encourage my daughter to lead a healthy lifestyle is by modeling it for her. There are also some things our family does to stay active together and have fun doing so. We enjoy going on family walks together. We also love to enjoy other outdoor activities such as a hike in the foothills or a jog along the beach. Being active together a perfect opportunity to bond as a family. We also allow my daughter to make choices of physical activities that she enjoys doing to maintain that active lifestyle. 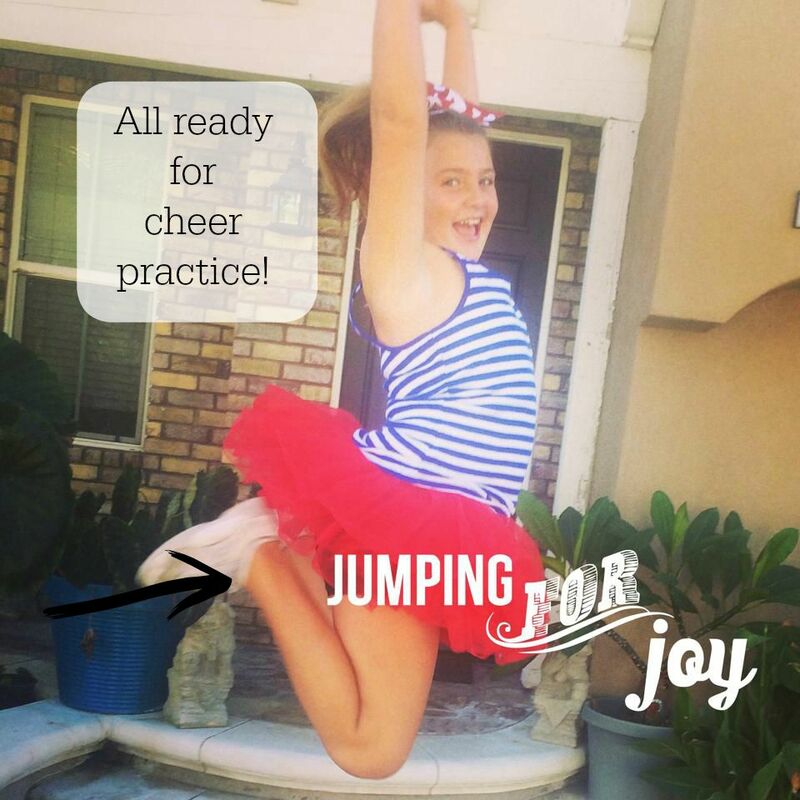 She is pretty athletic and has participated in a variety of activities ranging from dance & cheer to swimming & martial arts. It’s also very important to teach children about the importance of making healthy food choices, whether they are eating at home with you or our somewhere on their own. Our family spends time together on Sundays doing meal planning and grocery shopping for the upcoming week. Since our work, school, homework, and extra-curricular activity schedule are somewhat busy ones, we try our best to prepare meals together in the kitchen about 4 times a week. Dinnertime is when we share about our day and talk about anything else we’re excited about. It’s also important to teach your children to give back to the community. I believe that giving back is one of the most important things you can do for others. Also, by doing so, you are modeling the importance of thinking about others’ needs and serving others for your child(ren). We seek out different ways to give back including volunteering with the homeless and bringing necessary supplies to the animal shelter. The Boys & Girls Clubs of America has a great resource for families trying to live an overall healthy lifestyle called Triple Play. The program is the leading comprehensive health and wellness program and serves young people at Boys & Girls Clubs. Triple Play gives kids the tools and awareness necessary to put them on the path to a great future. This is exactly what we want for our children. Mind: Develops a knowledge base for young people to acquire healthy habits, such as making smart food choices, understanding appropriate portion sizes and creating fun and balanced meals. Body: Promotes young people becoming more physically active through fun daily fitness, including activities to get kids active and moving. Soul: Strengthens interpersonal skills, positive behavior and good character through social recreation programs and activities. At the start of the new year, Boys & Girls Clubs of American established a key mantra, “I Feel Better When..”. As many people recommit to improving their health and wellness practices at the start of a new year, the BGCA is committed to implementing this phrase, which can lead to how small, daily behavioral changes can have a long-term, lasting impact. Triple Play is focused on healthy lifestyle changes at a young age. In our own family, we do a few different things to promote a healthy lifestyle. I feel better when…we model an active lifestyle, make healthy food choices, and give back. What about you and your family? What can you do to support this mantra? National support from the Anthem Blue Cross Foundation and Coca-Cola make it possible for Boys & Girls Clubs around the country to operate Triple Play. For more information about wonderful programs like this one, visit the Boys & Girls Clubs of America Triple Play Website here. Connect with Boys & Girls Clubs of America on Facebook and Twitter, too. This post was sponsored by Charmin as part of an Influencer Activation for Influence Central. All opinions are 100% my own. I don’t get it? It seems like every time I turn around (to go potty), the toilet paper holder is empty! There’s no possible way that it can always be my turn to change the roll..but it is! I think I’ve discovered what a big part of the problem is…the rolls I’ve been using are too small and they run out super quickly. (Another part of the problem involves the rest of my family being lazy!) Well, I think I’ve found a solution! Charmin® Essentials are here to help! Just look at the size of their rolls! They’re huge! I’m not saying that having bigger rolls of toilet paper in my bathrooms is going to motivate my family more to help replace them when they run out, but it’s going to make my job as “toilet paper roll changer” much less demanding! Hehe! What are these Charmin® products I speak of? Charmin® Essentials Soft and Charmin® Essentials Strong are two new products that were designed to provide shoppers, like me, with more of what they want in their toilet paper at a comparable price to the product they currently use. The Charmin Essentials Soft provides Charmin-­like softness at an Angel Soft®- like price while while Charmin Essentials Strong provides a big Charmin roll at a Scott® 1000- like price! No matter which of the two you try first, I’m pretty sure you’re going to love it! These quality products are available at a comparable price to the leading bargain brands, so you, your family, and your budget don’t have to compromise! The “budget” part of that is a high priority for me, as the one in the family in charge of handling the finances. (Yes, I do that, too!) Now you can participate in the #CharminEssentials TP swap! Have you heard about it yet? Charmin is inviting shoppers to upgrade their Angel Soft® for Charmin Essentials Soft and Scott® 1000 for Charmin Essentials Strong. All you have to do to participate is simply Tweet their TP swap out request to @Charmin using the hashtag #CharminEssentials and #Promotion, and Charmin will send you a free roll. For more information about it and to read the terms and conditions of this program, go here. To learn more about Charmin Essentials Soft, go here and to learn more about Charmin Essentials Strong, go here. You can also connect with Charmin on Facebook and Twitter. Scott® 1000 is a registered trademark of Kimberly-Clark Worldwide, Inc. This post was sponsored by Nature Made® as part of an Influencer Activation for Influence Central. The start of each new school year is another chance to get organized and re-establish a daily routine. 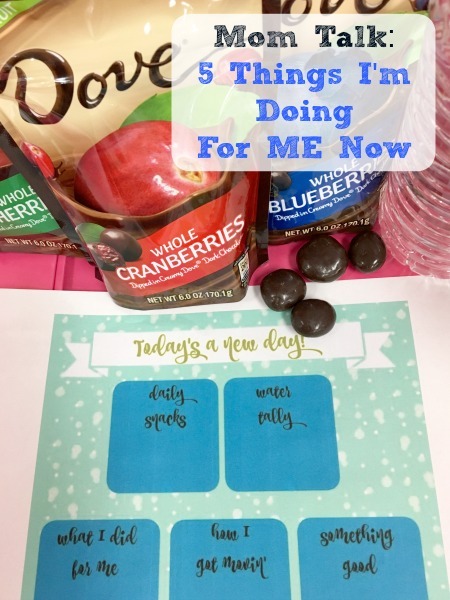 This year, I’m hoping to not only establish a routine that helps our mornings run smoother, but to integrate some healthier habits for my family, especially my daughter. When I say “healthier habits”, I’m referring to a healthier diet, filled with better nutrition. Sometimes, the hustle and bustle of a busy life can interfere with efforts to eat a more balanced, healthier diet though. As my daughter gets older, she seems to have gotten pickier about foods that she’ll eat. It seems like she’ll gobble down any vegetable on the planet (even Brussels sprouts) but fights me when it comes to fruit. It’s so strange. As a mother, I’m always concerned about my daughter’s eating, mostly concerned about her nutrition. I also feel like lack of nutrition affects learning and education is something we place a high priority on. One way for my daughter to get the vitamins she needs is for me to give her Nature Made® KIDS FIRST Multivitamin with Omega-3 Gummies daily. They are great-tasting gummies that come in Strawberry, Lemon, and Orange. (They’re all natural fruit flavors.) Have you seen tried these with your kids yet? I found them when I was shopping at Target, near the pharmacy and healthcare section. They are definitely kid-friendly and she loves taking hers every morning before school. Nature Made® KIDS FIRST Multivitamin with Omega-3 Gummies provide 3 key nutrients, plus the essential omega-3 fatty acids EPA and DHA. I worry about artificial colors but their colors are actually derived from natural sources and don’t contain any synthetic dyes. 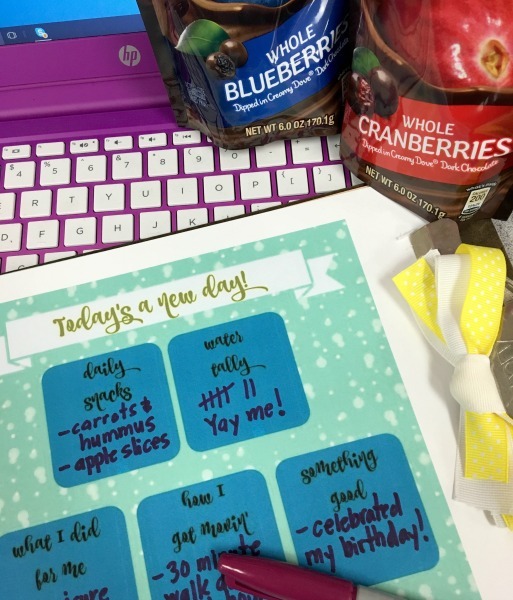 I feel confident that we’re starting the new school year on track with healthy habits. Choosing high-quality vitamins and supplements from Nature Made® makes it easier. It also doesn’t hurt that I remind my daughter each morning before school that you can learn something new every day if…you take your vitamins! Connect with Nature Made® on Facebook and Twitter. Connect with Target on Facebook, Twitter, and Pinterest. As a first grade teacher, I get to work with the cutest kids! 6 and 7 year olds are so sweet. They also make some of the biggest messes and manage to get completely dirty during a single morning recess. Since I’m also a mom, things like dirty hands and faces or runny noses don’t bother me when I’m in the classroom. I do, however, place importance on cleanliness both at home and in my classroom. 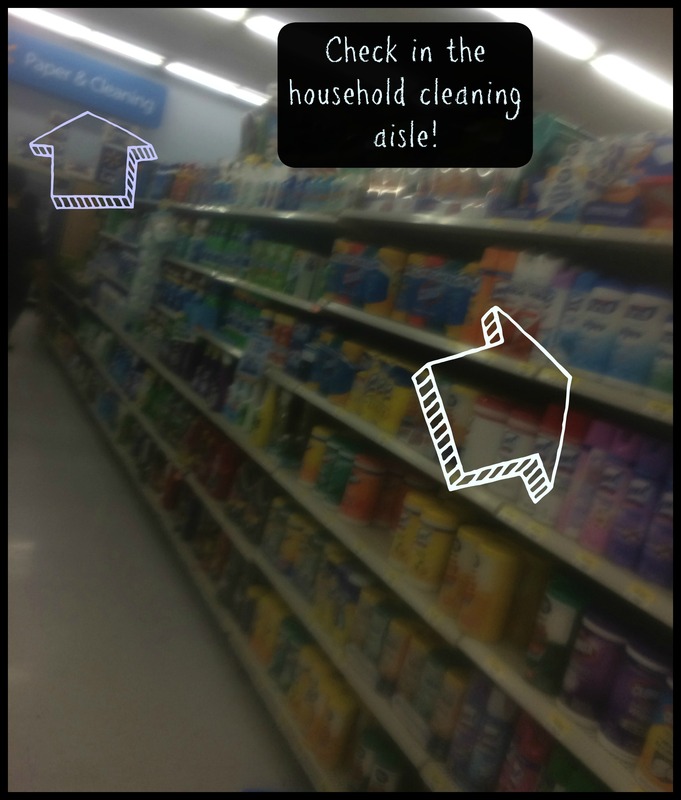 I’m really particular about the products I choose, always trying to find cleaners that don’t contain chemicals. I know that I don’t want my daughter coming in contact with harmful chemicals and I”m sure my students’ parents want the same thing for them! In my classroom, we like to do art whenever it fits into a school day. Since we don’t have a sink in the room, I have to be creative with cleaning and hand/face washing, especially during art. I truly believe that art is supposed to be messy and I’m Ok with it. I was excited to learn about WaterWipes. Have you heard of them yet? They are chemical-free baby wipes that only contain two ingredients: 99.9% pure Irish water and 0.1% grapefruit seed extract. I found mine at Babies R’ Us near the diapers and wipes. I carry around baby wipes with me at all times and use them for everything. For a store locator, go here. WaterWipes are just the perfect kind to keep on hand in my classroom though. I appreciate brands that are considerate about the ingredients they choose to include in their products. I’ve found WaterWipes to be both durable and effective for cleaning up classroom messes and little first graders’ hands, without containing any of the harmful chemicals that may be found in other baby wipes. I’m looking out for my students so I choose WaterWipes as a safer, natural option for my classroom cleanup regimen. Do you have a “go-to” for cleaning up little hands and faces? Right now, you can enter to win one of five (5) $100 Babies”R”Us gift cards. You can enter below through August 18, 2016. Winners will be randomly selected from all of the entries. Good luck everyone! Connect with WaterWipes on Facebook and Twitter. We recently moved into a new home and I am absolutely in love with having everything brand-new, especially my kitchen. One thing I still haven’t gotten used to in this kitchen though is having such a large countertop space. My counter top is grey quartz and includes the sink, the prep area, and an area to sit at barstools, directly in front of the sink. There’s no real separate place to set my dish cloth, pot scrubber, and my dish liquid, NEW Palmolive® Fusion Clean™. It seems kind of awkward to have these things sitting right in front of where people gather, The big countertop is intended to be the focal point of the room. It’s also the area where everyone’s things “land” when they come home, like keys, wallets, planners, etc. I’m going to share a picture of what my counter top looks like on any given day with you, so please don’t judge. I realized that I needed help staying more organized in that area. So I decided to make a decorative sink organizer using a Mason jar, that I could keep right up on the counter. So let’s look closer at my sink area now. Storing the metal scrubber, the scrubber on a stick, and the dish cloth in the Mason jar seems to keep it all looking nicer. I like having my Fusion Clean™ Baking Soda & Lime out on its own because I use it so often. Have YOU tried it yet? New Palmolive® Fusion Clean™ dish liquid provides a Modern Twist on Cleaning™ It’s specially formulated for tough cleaning challenges and as you could see from my previous sink photo, my dishes sometimes pile up and don’t get washed right way. Luckily, the unique formula removes 24 hour stuck-on food. It’s available in Baking Soda & Lime (the green one) and Baking Soda & Grapefruit (the pink one). I found mine at Ralph’s,on the household cleaners aisle, and couldn’t decide between the two, so I bought both! You can find New Palmolive® Fusion Clean™ dish liquid at Kroger and Kroger Banner Stores. (Ralph’s, Fred Meyer, and Food 4 Less). I love how organized my sink area jar looks now and how the colors shine through the Mason jar on my counter. Pick up some NEW Palmolive® Fusion Clean™on your next trip. You can also grab a coupon for $0.50 off 22oz or larger one by clicking here. Thoroughly wash and dry your Mason Jar. Draw your design onto the jar. I highly recommend practicing beforehand on paper. If you make a mistake, you can “erase” by dapping the area with a cotton swab containing nail polish remover. Make sure the glass is dry again before resuming the drawing. When you are completely happy with your design, allow the jar to dry for 24 hours. After 24 hours, you’ll need to “bake” your jar, to set the design on the glass. Place the jar, upside-down on a baking sheet, into the cooled oven, Turn on the oven to 350 degrees, allowing the jar to heat up along with the oven. Having the glass heat up with the oven, will help avoid cracking of the glass. Allow the jar to “bake” for 30 minutes. At this point, turn the oven off and open the oven door to allow the jar to cool down with the oven. Remove the jar after it’s cooled down. The jar will be completely sealed at this point. I highly recommend hand washing the jar instead of putting it into the dishwasher. I still can’t decide which is my favorite! They’re all really yummy and something I enjoy in moderation each day. 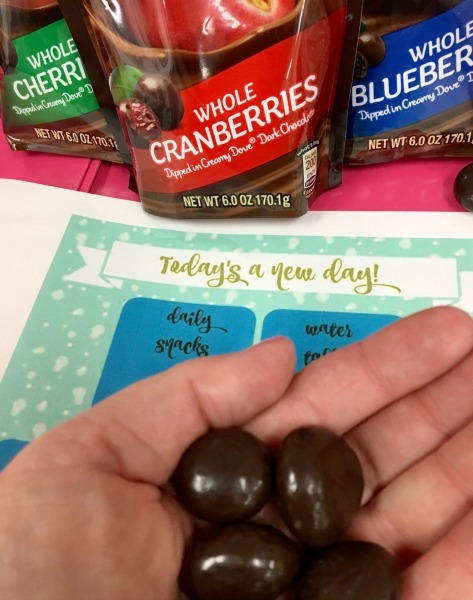 They combine the wellness benefits of dark chocolate with fruits while satisfying my craving for something sweet and keep me in line with my goals for the New Year. Trying to keep up with being a mom and working a full-time job, in addition to all of life’s other things that keep me busy, is a lot to juggle. I feel like on most days, I fail at fitting it all in. I find myself doing everything for everyone else at home or at work and leaving very little time to take care of me. I will totally admit that in the last few years, I’ve gotten in the habit of practicing “Mom Self-Neglect” on myself. I know there are other moms like me who can relate. What happens is that I’m left at the end of the day with zero energy or extremely exhausted and a feeling unaccomplished. 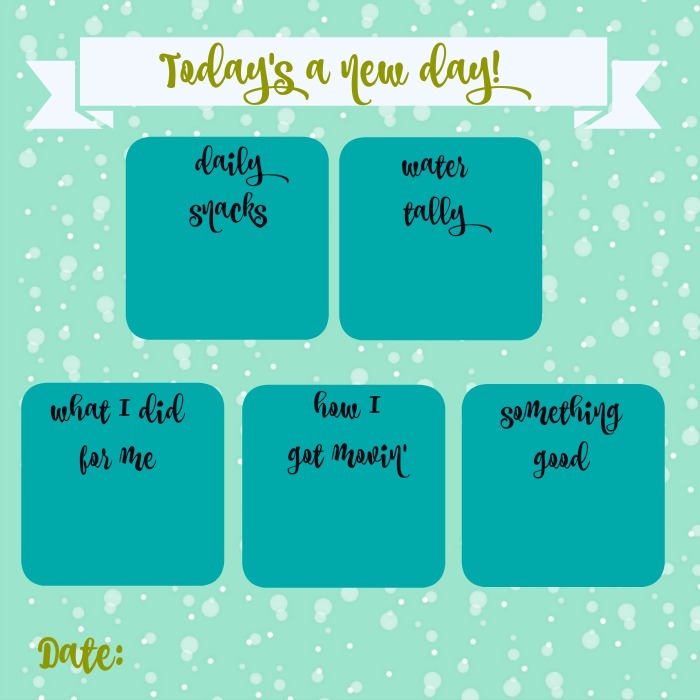 I started using a daily printable (see below to print out your own copy) to keep track of my days. I keep it nearby on a clipboard.. It allows me to see my accomplishments, no matter how small they are, as well as look back on previous days to see how well I’m doing. One of the strategies I discussed with the life coach was treating each day as a new beginning. It’s hard to make changes and sometimes I feel like I want to be perfect, so when I’m less than perfect, it makes me feel frustrated. By starting fresh each day, it’s a new chance to achieve the goals. Reward yourself. Drink More Water – I seriously need to drink more water! I don’t know why it’s so difficult for me to do this but I know I’d feel better if I did it. There are just so many benefits to drinking a lot of water. On some days, I actually find myself carrying around a water bottle around and not even drinking it! I set a goal of 6 small water bottles a day, so I’m keeping track with tally marks. Eat Better – One of my biggest downfalls, is failing to prepare food and snacks for myself. To be perfectly honest, sometimes I’m just too busy to pack my own lunch and opt to just skip a meal or grab something on the go, which isn’t always the best option. Carrying more snacks with me to eat during the day is a goal for me. Get Movin’ – Although I am active at my job and am constantly on the go, I need to make an effort get out walking or to the gym to do some cardio, even if it’s just for 30 minutes a day or so. There are many benefits to exercising regularly. Take Time For Me EVERY Day – It’s important to set time aside for yourself each day, even if it’s just 20 or 30 minutes to read or watch TV or do something you enjoy, which allows you to unwind. Ultimately, this makes you feel like you’ve done something for yourself. Acknowledge the good in every day – Since I’ve taken on the viewpoint that each day is a chance to start again, I’m also trying to think about the good in each day, no matter how small it may be. It’s helpful to write down something positive that happened or that I did on my log. So far this year, I feel like my new outlook, along with my daily log, has really helped me stay more positive and keep more focused. It’s nice to be able to look back and see that I actually have accomplished things on a daily basis. The link to this free printable is right below the image. Print out this free printable by clicking here. So, what are you doing to take care of yourself? Have you set any goals this year for your own well-being? 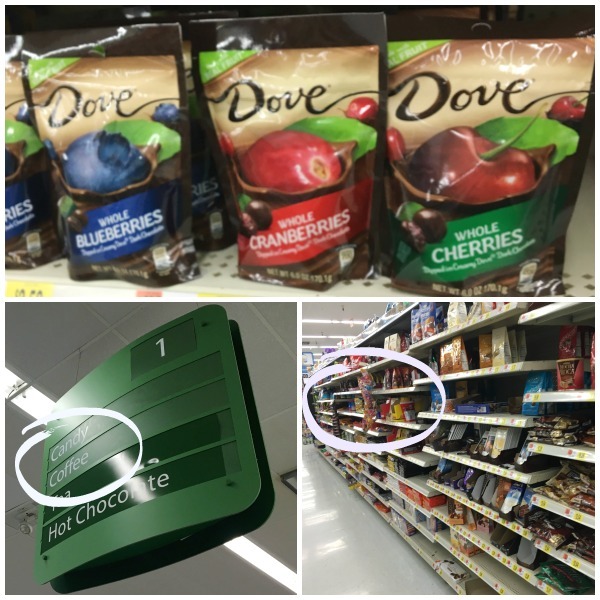 Have you tried the DOVE® Chocolate Fruit & Nut yet? To print out a coupon, click here. Thanks for reading and have a great day! We stay extremely busy and do a lot of running around. Whether it’s getting to work, school, after school activities, sports practices or play dates, I often feel like I don’t stop moving. I also sometimes feel like I don’t ever get anything done around the house, especially the laundry. I’ve got major “Busy Mom Problems”! I recently discovered some new & wonderful Clorox® products that I swear were invented specifically for moms like me! 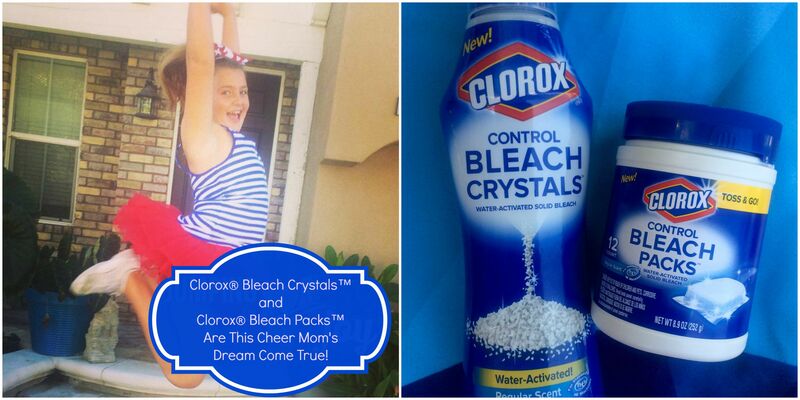 Have you tried Clorox® Bleach Crystals™ and Clorox® Bleach Packs™ yet? Well, they are like a mom’s laundry dream come true! Seriously, these products are both water activated and only start working when you want them to. The water activated component takes the fear out of using bleach because there are no more spills, splashes or bleach damage to my clothing! Both the packs and the crystals are compact and easy to store, too. My personal favorite of the two are the Clorox® Bleach Packs™ because not only is there no bleach pouring required, you also don’t have to measure anything. 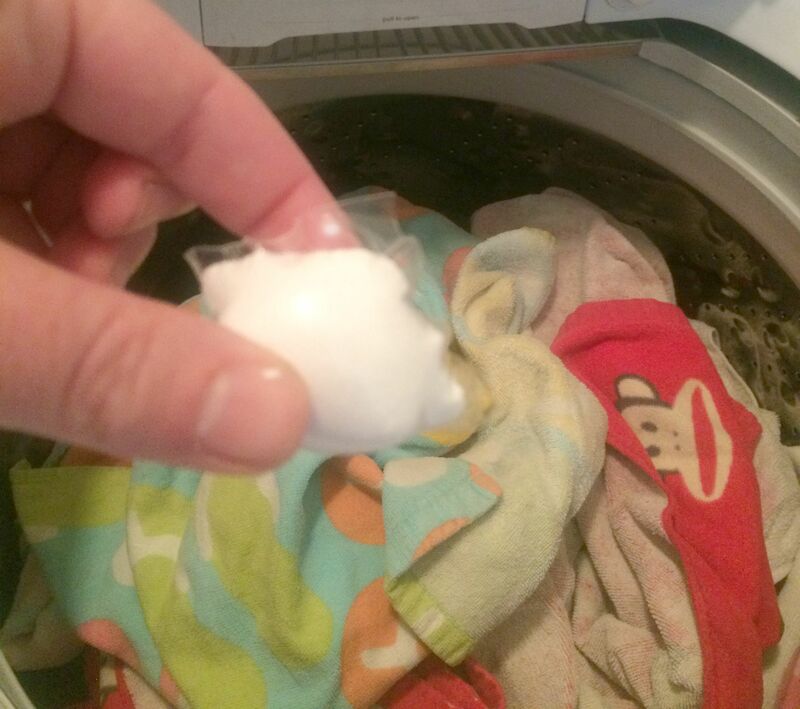 Just toss one little bleach pack in with the load in your washer and walk away without worrying! 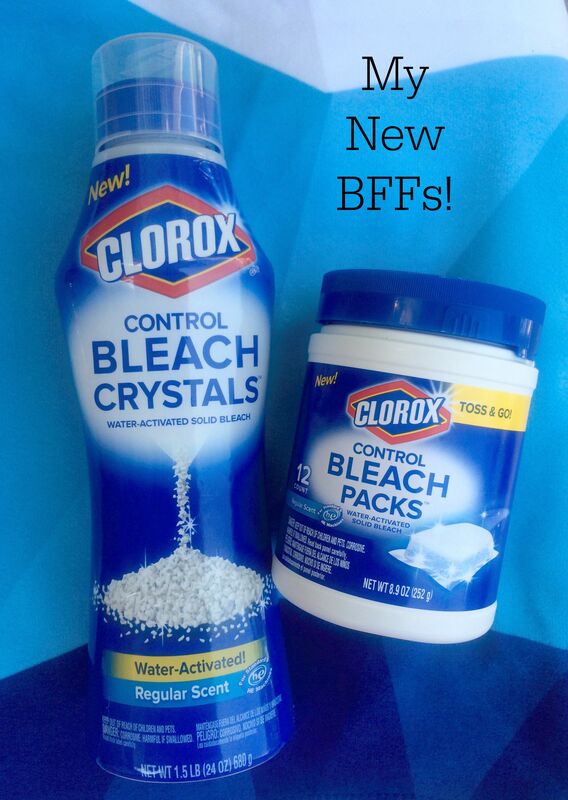 Clorox® Bleach Packs™ are literally game changers for me and I’m going to tell you why! One of my biggest pet peeves is when my daughter can’t find a pair of clean, matching white socks. She has to have bright white socks for cheer practice and competitions and there’s nothing worse than watching her search the house for socks and hearing her say that she doesn’t have any clean ones! I buy her so many socks that there’s no way she doesn’t have any! 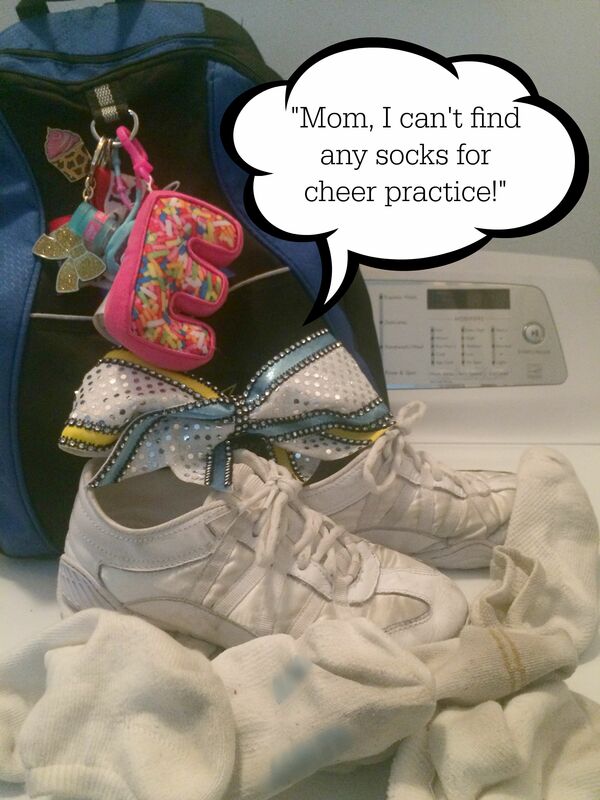 I know I can always find some socks for her in her cheer backpack…DIRTY socks! 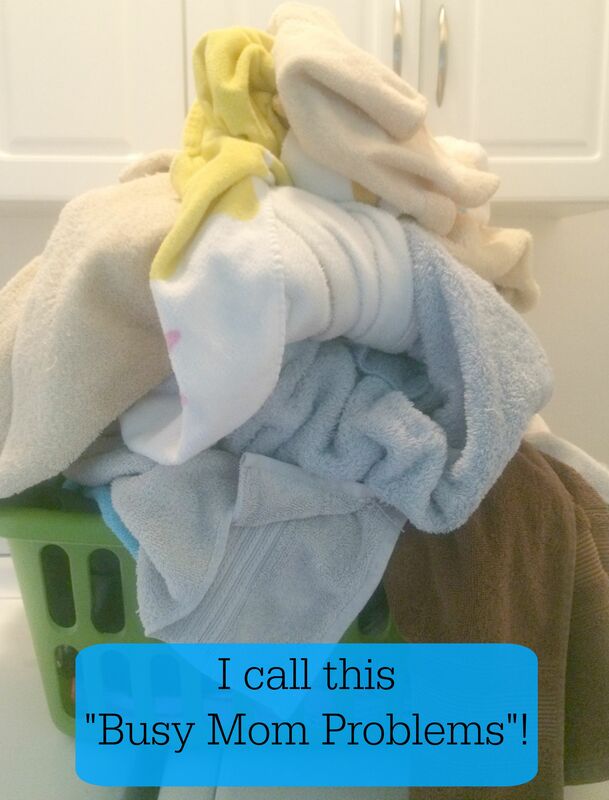 It can be frustrating because I often ask her to toss the dirty socks into the hamper so I can wash them. However, now I feel more confident knowing these Clorox® Bleach Packs™ will come to my rescue and get the socks bright white again, the way her cheer coaches demand they be! It’s a lot of pressure to be a cheer mom! (Ok, I may be exaggerating a bit!) I feel like I could jump for joy over how white her socks get with these. I think I’ll let the cheerleader do the jumping though! 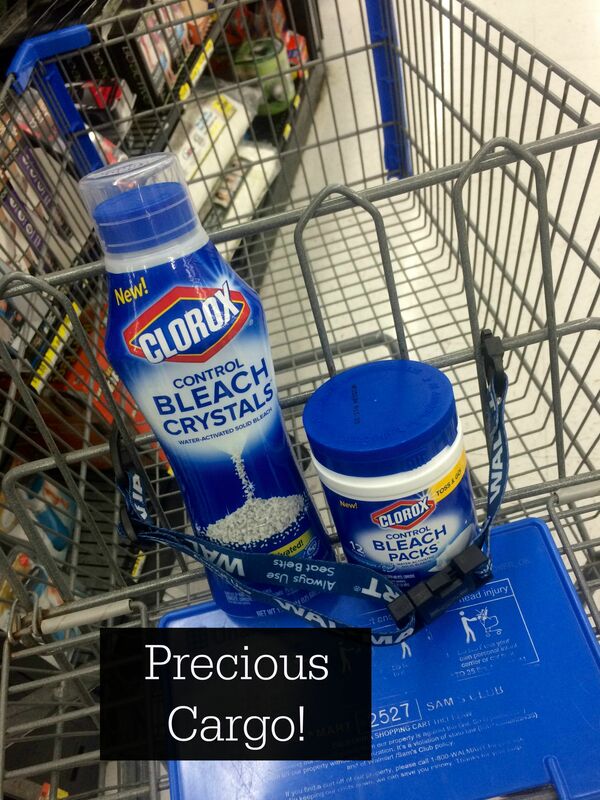 I found both the Clorox® Bleach Crystals™ and Clorox® Bleach Packs™ in the laundry aisle at Walmart. 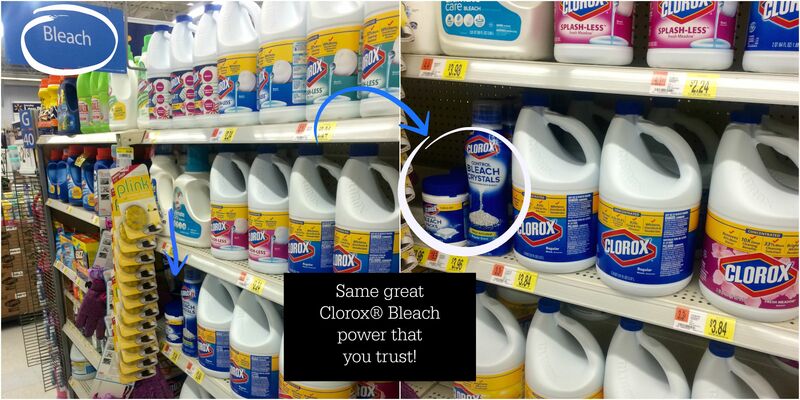 They were right near the other Clorox® bleach products. So easy to find! So, are YOU ready to incorporate Clorox® Bleach Crystals™ and Clorox® Bleach Packs™ into your laundry routine? To learn more about Clorox® products and to find a coupon for your next purchase, click here. Connect with Clorox on Facebook and Twitter. Open a 529 College Savings Plan For Your Child on ScholarShare’s National 529 Day! (5/29) If You Start It, They’ll Match It! 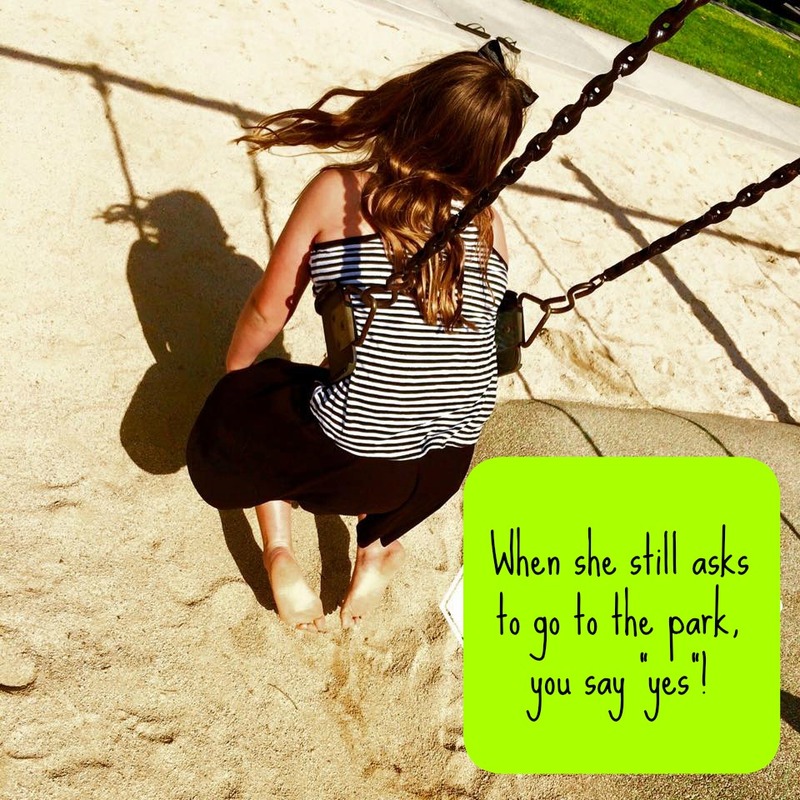 The other day, my daughter asked if we could go to the park “just for 5 minutes“? I had a ton of things to do and I almost immediately responded with a “not right now“. Then I stopped and thought about something…If she asks to go to the park, I should say “yes” because for all I know, it could be the last time she’ll ask. (*insert lump in throat). She’s not getting any smaller and just turned 10! How did that happen? It seems like yesterday I was just rocking her to sleep every night in her nursery! Time goes by THAT fast! Before I know it, she’ll be 17 and applying to colleges! Planning for your child’s future is something you can never start too soon, specifically their college career. To some, it may seem silly to think about planning so many years ahead for college, but the cost of college nowadays is no joke! 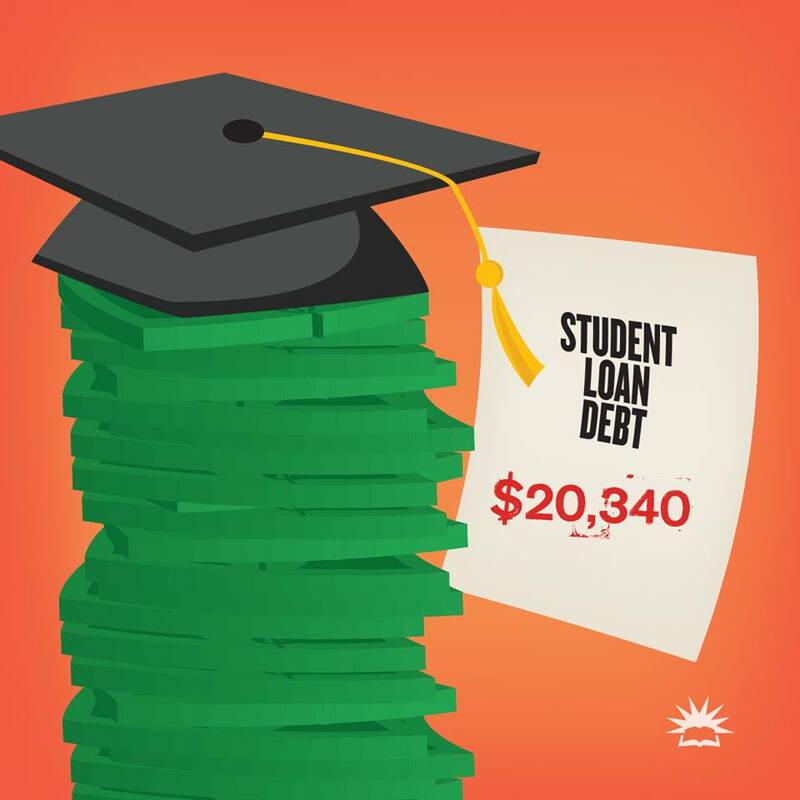 The costs associated with attending college can be overwhelming on a family and student loans are definitely not something a recent college graduate wants to have follow them! Just look at the scary statistic about student loan debt on ScholarShare‘s image below! Yikes! ScholarShare’s 529 College Savings Plan was created for the exact reason of helping alleviate some of these burdens of carrying debt for college students. If you haven’t heard of ScholarShare before, it’s California’s own 529 College Savings Plan. This state-sponsored program is a tax-advantaged investment, designed to help and encourage families to save for future qualified higher education expenses. The sooner you start saving, the more time it will have to grow. ScholarShare has no annual account management fee, no income limit and offers a high maximum account balance. Anyone can contribute to a 529 account- Through ScholarShare’s “Give a Gift” option, family members, such as parents, grandparents, aunts, uncles, and even friends, can make a gift contribution to an existing account. When they are looking to give a special gift to your child, why not suggest they contribute towards their 529 account?Did you know family members can even open a new account in your child’s name and contribute towards it over the years? On May 29 (5/29), ScholarShare is having a 529 Day Matching Promotion, “You Start It, We Match It.” In celebration of National 529 Day, if you open a ScholarShare 529 College Savings Account on Friday, May 29, 2015 from 12:01 a.m. to 11:59 p.m. PT, ScholarShare will match $50 of the initial deposit, which means your account will now start with $100 balance! If you don’t already have a ScholarShare 529 Account, this is the perfect day to start an account for your child(ren). Enroll in the automatic contribution plan (ACP) for the new account with at least a $25 contribution per month. The terms of this promotion also state that the initial deposit be made on Friday, May 29, 2015 between 12:01 a.m. to 11;59 p.m. PT. Like I said before, time isn’t slowing down but rather, it’s doing the opposite. Starting a ScholarShare 529 College is so easy and you can even create your account online here. Then you can watch your initial $50 deposit transform into $100! That sounds like an opportunity that should not be passed up! For more information about ScholarShare, click here. Connect with ScholarShare on Facebook and Twitter. This is a sponsored post on behalf of ScholarShare for which I received compensation. All opinions are 100% my own. 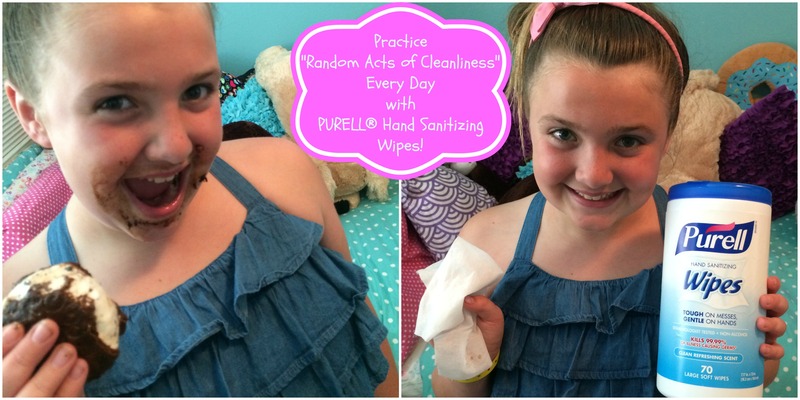 Practice “Random Acts of Cleanliness” Every Day with PURELL® Hand Sanitizing Wipes! “You should practice Random Acts of Cleanliness every day!” This was what I jokingly said the other day to my daughter as a suggestion for something she should do more often. There she was, making a mess in her room (which is nothing new), and it just kind of came out of my mouth. I kind of liked how it sounded, too! (I love making up new words and clever sayings) She laughed and tried to correct me, asking if I’d meant to say “Random Acts of Kindness“? I then explained that I’d meant exactly what I’d said. I also told her how happy it would make me if she did practice “Random Acts of Cleanliness” around the house more often, without being asked. What mom wouldn’t love that? 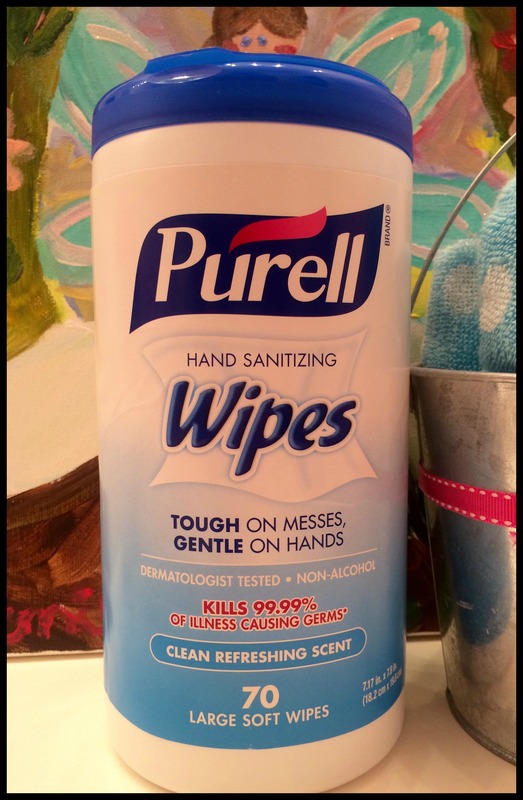 I recently stocked up and using these new, amazing PURELL® Hand Sanitizing Wipes. They’re now available in most Walmart stores in the household cleaning aisles in convenient canisters. I grabbed a few of them for my house so I could have them handy at all times, both upstairs and down. I read that they are proven to reduce the transmission of germs in households. A study recently conducted by a leading researcher at the University of Arizona showed a significant reduction in risk of infection with use of PURELL Wipes in the home at least once per day . Used with or without alcohol-based gel hand sanitizers, a superior form of reducing germ transmission, wipes have the added convenience of removing soils. Wipes are a convenient way to both cleanse the hands and reduce transmission of germs. The other day, I’d just finished doing some Spring cleaning around the house when I walked upstairs to find a very messy dance party (which happened to involve a chocolate ice cream sandwich) happening in my daughter’s room! Don’t get me wrong, I’m a big fan of dance parties, but WHOA…her face! It just goes to show why I really need to keep PURELL® Hand Sanitizing Wipes on hand. They’re safe to use on chocolatey hands and faces! I am just glad I had them handy! PURELL® Hand Sanitizing Wipes are available in 2 sizes…a 70-count Clean Refreshing Scent canister and a 35-count Fragrance-Free canister. I grabbed a few canisters of each size the other day at Walmart. Be sure to look on the Household Cleaning Aisle to find them. 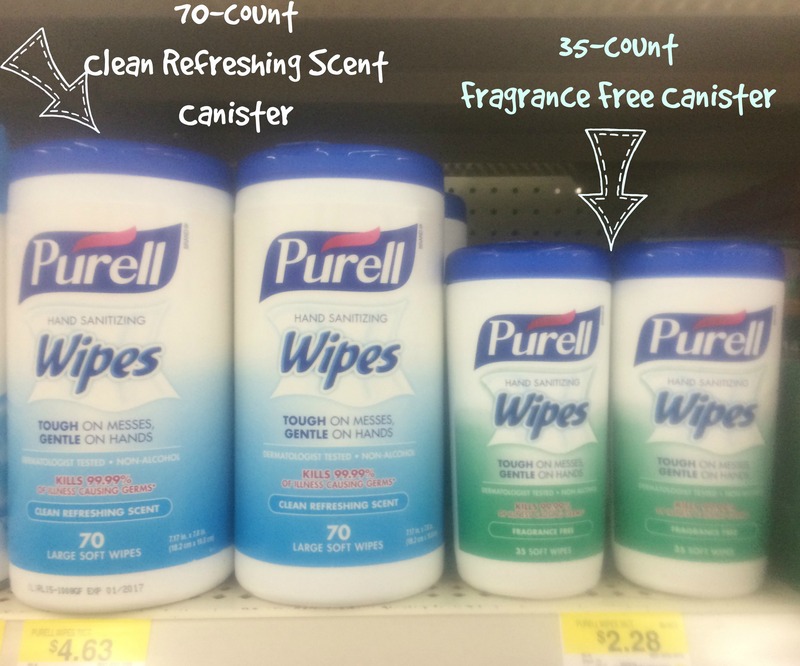 Beginning on May 17th, shoppers will be able to save $1.00 on any PURELL® Wipes canister or save $1.00 on any two PURELL® Products. Just click here for a coupon. 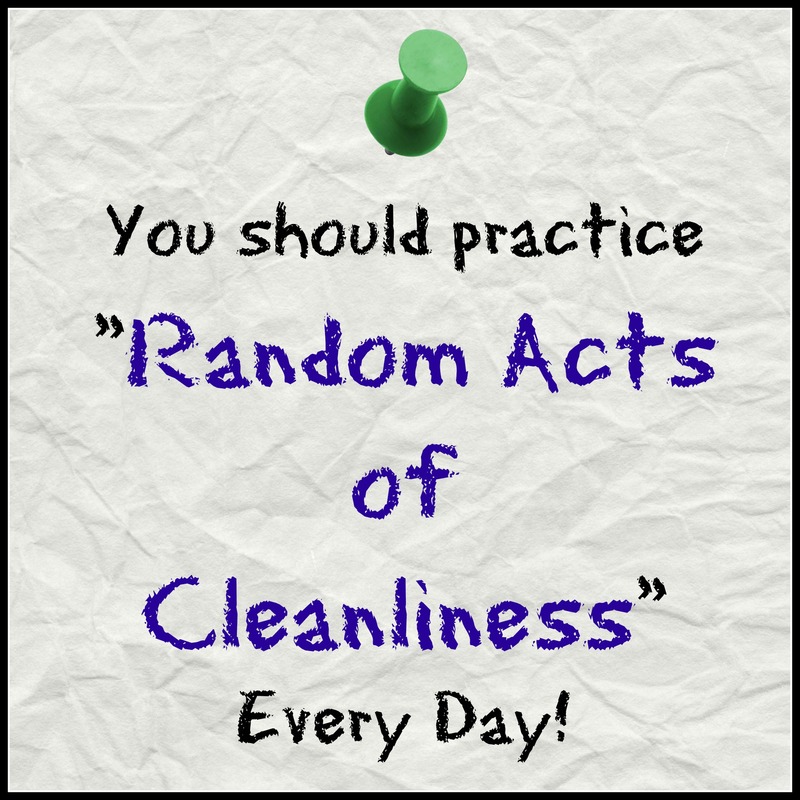 So, do YOU practice “Random Acts of Cleanliness” every day? Read about PURELL®’s loyalty program here! Here’s a short video demonstrating how the scene played out! Enjoy! 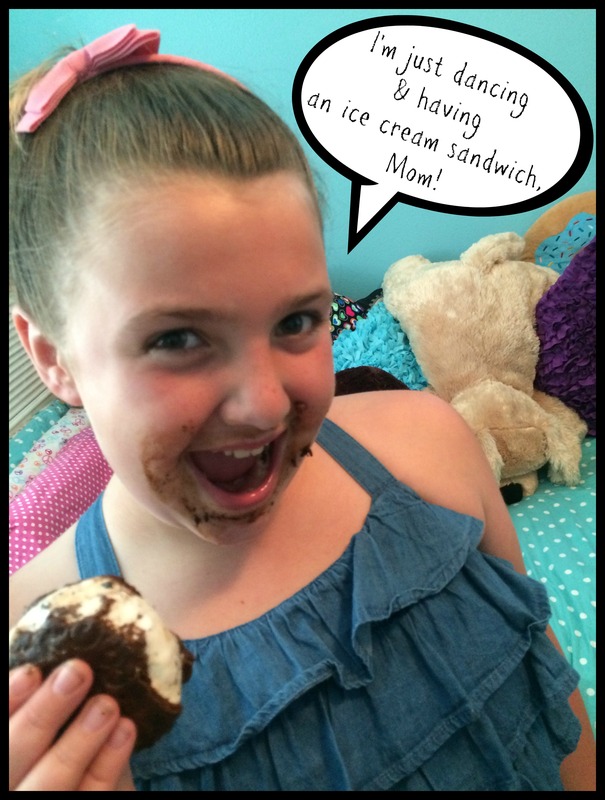 I love keeping these #PURELLwipes handy at all times…especially when Emi decides to have a messy chocolate ice cream sandwich in her just-cleaned room! It’s hard to get mad at that chocolate face though!